Ghananie.Com: Speaker and deputy 'abandon' parliament? Mr Osei Kyei-Mensah-Bonsu, Deputy Majority Leader, on Tuesday raised issues over the whereabouts of the Speaker, Mr Ebenezer Sekyi Hughes, who was not available to preside over Tuesday's sitting. He said members of parliament had a right to know where the Speaker was if he cannot attend to business in the House at any given sitting. The Deputy Majority Leader brought the issue to the fore when the Second Deputy Speaker of the Parliament, Alhaji Malik Yakubu, sat in for the Speaker. 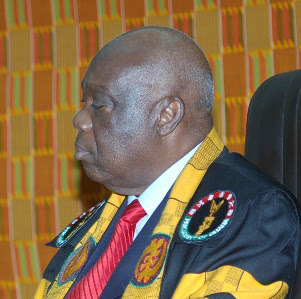 Quoting Standing Orders 13 (1) and 13 (2), Mr Kyei-Mensah-Bonsu said the House needed to know where the Speaker was at every given time because the President always informed Parliament of his absence from the country and when the Vice President had to take charge in line with constitutional provisions. According to Mr Kyei-Mensah-Bonsu, it was the duty of the Clerk to inform the House of the absence of the Speaker and who was deputizing for him. "I call on the Clerk at Table to do the right thing in accordance with Standing Orders 13 (3)," the Second Deputy Speaker then had to rule. This forced Mr Emmanuel Anyimadu, Clerk to Parliament, to rise to his feet and inform the House that the Speaker was not available to preside and therefore the Second Deputy Speaker was taking charge. Later, Alhaji Yakubu told the House that the Speaker had traveled to Kuwait at short notice, while Mr Freddie Blay, First Deputy Speaker, had also gone to Burkina Faso. The Standing Orders of the House states that whenever the House is informed by the Clerk at the Table of the unavoidable absence of the Speaker, the First Deputy Speaker shall perform the duties of the of the Speaker in relation to all proceedings of the House. The Second Deputy takes charge in the absence of the Speaker and First Deputy Speaker.